Welcome To Delaware, Home Of The $410,000 License Plate In Delaware, a license plate recently sold at auction for nearly a half million dollars. Auction house owner William Emmert gives insight into the state's collecting culture. In 2008, the No. 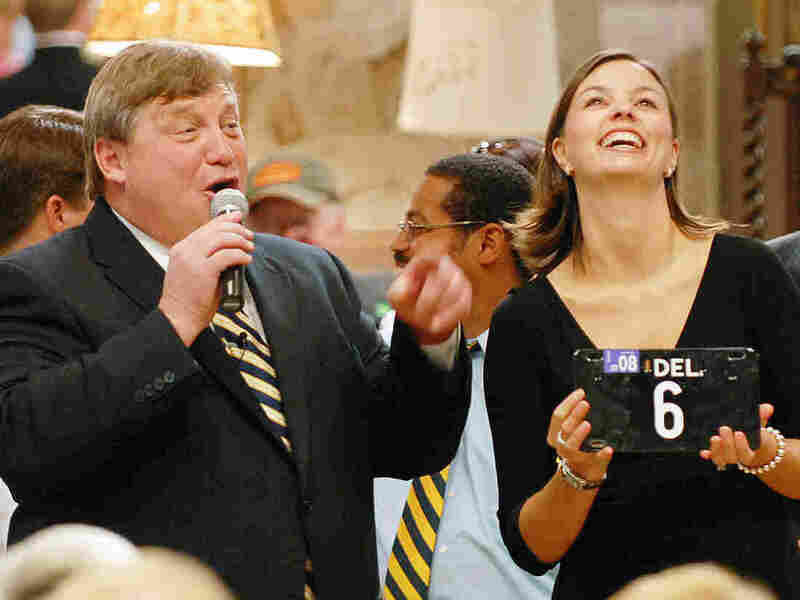 6 Delaware license plate was auctioned off for $675,000. This past Monday, Butch Emmert, left, auctioned off the No. 20 tag for $410,000. License plates are strictly utilitarian in most states, a number to identify a car. Some states include artwork on their plates — oranges in Florida, a peach in Georgia — or slogans, like "Land of Lincoln" in Illinois, or "Live Free or Die" in New Hampshire. In Delaware, license plates can be investments. On Monday, a license plate hit the block at Emmert Auction Associates in Rehoboth Beach. The winning bid was $410,000 — yes, nearly half a million dollars — for license plate No. 20. It's tempting to wonder whether this plate must have some sort of tie to a celebrity or artist to be worth that much. But no, dear reader, it came from an estate in northern Delaware, according to William "Butch" Emmert, the owner of the auction house. "[It came from] a lovely lady that passed away of some means and wasn't a celebrity, but anybody that has a tag like that inherently is a celebrity in the state of Delaware," Emmert says. That's because in Delaware, it's not so much the plate that's worth the money, but the number that's on it. "In the state of Delaware, the governor has No. 1, the lieutenant governor has No. 2 and the secretary of state has No. 3," Emmert explains. "Everything above No. 3, from three to infinity, are all there, available and can be traded." Emmert says that in the '40s and '50s, license plates were traded as political favors, but that the practice of trading and selling them became more regular with time. "What you're actually doing is you're exchanging tags with someone who has a worthless tag," Emmert says. "Now, it's not the plate, it's the number. It's a way of transferring wealth from one generation to another. It's like getting a great piece of art." As time has gone on, plates have increased in value. In between 1958 and 1959, for example, the No. 20 tag was worth $5,000, compared to this week's winning bid of $410,000, Emmert says. Not just anyone can buy these plates, though. You have to be a Delaware resident with a Delaware driver's license, Emmert says. Of course, that hasn't stopped people who are out of town from getting in on the bidding. Emmert says folks who were on vacation in places as far away as Norway called in for the auction. And if you're still shocked at the $410,000 price tag, Emmert says that's not the highest bid he's seen. A few years back, the No. 6 tag went for around $700,000. As for Emmert, his license plate is No. 107, and as he says, "it's a good one." In an earlier audio version of this story, Roger Williams was referred to as the founder of Delaware. Williams actually founded the colony of Rhode Island.